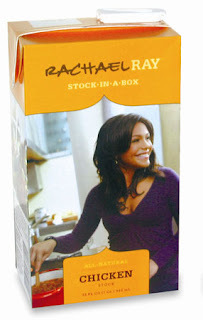 Rachael Ray has been extolling the virtues of chicken stock in a box for as long as I have been watching her show. In the past, she has used the Kitchen Basics brand, which I use and love. It's actually the only stock they sell in my store, although you can find about 10 brands of chicken broth. So, imagine my surprise yesterday when I learned from watching Rachael Ray's talk show that she has created her own Rachael Ray all-Natural Chicken Stock and Rachael Ray all-Natural Beef Flavored Stock. Not surprisingly, said chicken stock comes in a box. The stocks join Rachael's existing line of EVOO, Balsamic Vinegar, and Balsamic Drizzle (I've never seen and couldn't find those last two, so we'll have to take their word for it). Rachael has teamed up with Colavita for all of these products. Rachael considers stock an essential pantry item. Now consumers can experience what Rachael calls STOCK-IN-A-BOX without sacrificing flavor for the convenience of a prepared stock. The "Stock In a Box" are specially produced under Colavita’s direction to Rachael’s specifications ensuring the ideal blend of vegetables and seasonings are used to create a high quality, great tasting stock. Both STOCK-IN-A-BOX are perfect for creating Rachael’s famous “30 Minute Meals.” Each 32oz container features a unique recipe by Rachael and usage suggestions. The re-sealable aseptic carton allows for any remaining stock in the box to be stored in the fridge. They don't sell Rachael's EVOO in my grocery store, so I doubt I'll see this product either. Although, it can be purchased online. Let me know if you see it in your store and tell us what you think about it. I buy her EVOO at our Wal-Mart Supercenter. Ohh...very cool catch Madeline! I just wish they were low sodium. PS: have you had to sharpen your Rachael knife yet? Mine suddenly went super dull and I'm now in search of a good knife person to whip it back into shape. I have a Henkel chef's knife but it so heavy. It hurts my hand to use it. I miss my pretty Furi. I believe Rachael has a knife sharpener in line of products. Erin - don't kick me out of the RR club, but I don't have her knives. She came out with all her products a couple years after I got married and had already accumulated Calphalon cookware and Wustof knives. But, I do have the Wustof Santoku knife and just got it sharpened. The knife shop said knifes should be professionally sharpened every 4-6 years. And Anony is right, Rachael has endorsed the Furi knife sharpener. I can't get her knives here in Aussieland :( and have asked them if they would bring out her range somewhere... no reply of course. Anyway - I wondered how long the RR name would be on a stock in a box, pity we don't get any of her grocery items too... do you know if they are gluten free? Nellbe - I'm thinking it's not gluten free. I can get her EVOO @ my grocer called ShopRite. Haven't seen the Balsamic or stock yet but I am going to email several stores to request they order it. Food Network site wants almost $20 for 3boxes which includes s&h but still that's a little much. While I am here, does anyone have her microwave? I seen a lot of online places no longer carry it but I see Fingerhut has it in stock and I can make payments. The few reviews I seen weren't very positive but was curious. Any feedback would be appreciated. Thanks! Anony - I really haven't heard that much about the microwave, but it wasn't on the market for that long, which is probably not a good sign. Thx Madeline! I know what u mean....but I really, really want it! :P ....my partner is like, "u r not making our kitchen a RR kitchen" but I love her and her line of stuff. She makes me get into the kitchen and cook my own food and I like knowing what's going in what I make and I like just about everything I make from her. I can't do a lot of it in a half an hour but I don't care lol. I enjoy her, ya know. I need to get a sn here I know. I will work on it. Hey - you'll get no argument from me for having a RR kitchen! I purchased the chicken stock-in-a-box. Fantastic flavor!!! I am down to one box and racking my brain as to where I bought it so I can go back and stock up (no pun intended). Really a great product. I had been using the organic chicken stock sold at Costco and recently have been using the Kitchen Basics. Rachel beats both on flavor and price. I found the Stock-In-A-Box at a WuperWalmart. My husband and I are hooked, the flavor is amazing! I hope they still have it in stock! I found the RR Stock-In-A-Box at a Super Walmart just last night. I have not tried them yet, but purchased both the beef and chicken varieties. They ARE gluten-free and MSG-free, and I paid only $2.18/quart for each. Great flavor! The side of the box says it's gluten free and it has 480 mg of sodium which makes it low sodium. Check other brands and you'll see they are over 900 mg sodium! I'm really picky about what I buy and will be getting more of this! I just bought this for the first time ( in Waldbaums) and I love it - it is low sodium but does not taste like it! Just used Rachael Ray stock in a box for the first,and last,time.This is without a doubt the worse stock I've ever used.Had absolutely no flavor,I may as well just used water! I tried sending an e mail to what I thought was her site,but it was not the right one and every other site I tried I could not get onto.Apparently Rachael doesn't want to hear anything negative about any of her products!